You can invite users to your CMS to collaborate with them. Inviting someone is a matter of having them sent an email via your CMS settings on your Scrivito dashboard (click the “Users” tab after selecting the CMS concerned). The email sent includes a link for accepting the invitation. Each CMS user can be assigned one of several roles, e.g. “Chief Editor”, to specify the actions the user is permitted or denied to perform (e.g. publish working copies). Only the users of a specific CMS are permitted to access and use the editing interface of that CMS (in accordance with the respective role you gave them). Neither users of other Scrivito CMSs nor visitors can open the editing interface of a CMS unless they have been invited and have accepted the invitation. After a new user has accepted the invitation, you can share your working copies with them. After creating a working copy, you are its only owner. To add further owners for collaboration, open the working copy settings. 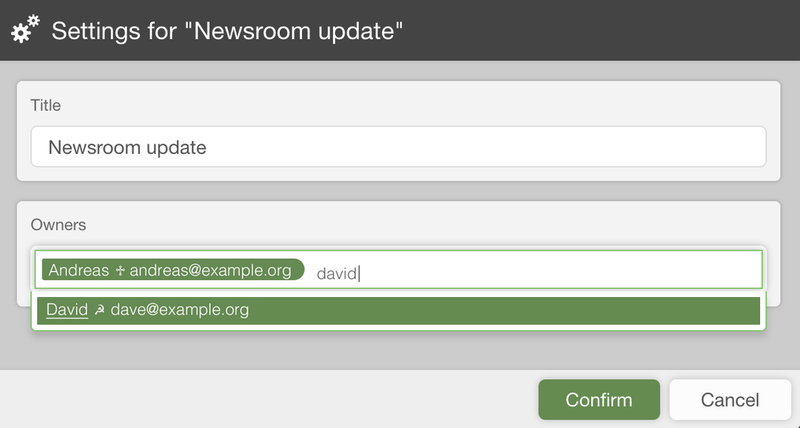 Now, in the “Owners” input box, place the caret behind your name or login, and start typing the name of the colleague. From the list of suggested users that appears, select the person you were looking for. Administrators have full control over the CMS and its working copies. Also, this role is required to invite users and to change a user’s role. Developers are permitted to deploy apps and change URLs. Owners of this role have access to all working copies and are permitted to publish any of them. A user with this role only have access to their own working working copies and are permitted to publish them. Owners of this role may access their own working copies but are not permitted to publish them, meaning that they need to approach a chief editor or an administrator for this.